If all went well, in Task Scheduler under Task Scheduler Library\Microsoft\Windows\PLA you should see your task as follows. Note in the settings, “If the task is already running, the following rule applies:” is set to Stop the existing instance. Herein is the issue. When the next stop command is issued, the collector takes time to stop. If you check the task history, it looks like this. We see the task stop (as configured) and then start, but then the action completes, and the task completes / stop. This is a problem as we want the collector to keep running. So… what’s going on. Well, lets open up Event Viewer. We want to go into Application and Services Logs\Microsoft\Windows\Diagnosis-PLA and select the Operational log. You should see an error. 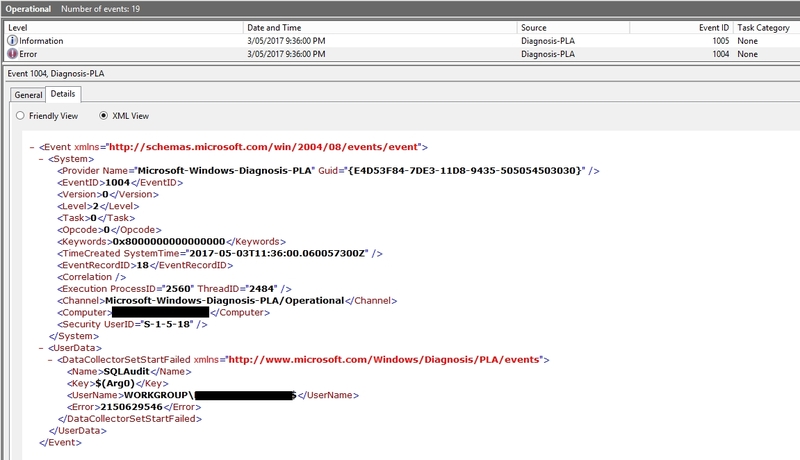 On the Microsoft page, https://msdn.microsoft.com/en-au/library/cc238505.aspx, error 0x803000AA indicates PLA_E_DCS_IN_USE, or the Data Collector Set is already running. I’ll show you how I worked around this in my next blog. « Using PowerShell to Setup Performance Monitor Data Collector Sets.